Patrol 56, U-190 under Max Wintermeyer, 15 days May 31-July 6 1943. Kapitänleutnant Max Wintermeyer brought his command U-190 into a complex patrol to the southwest regions of New England – basically 150 miles south of Martha’s Vineyard – between the 31st of May and the 6th of July 1943. The first leg consisted of an incursion starting about 100 miles south of Montauk New York, heading east for two days until June 2nd. Then Wintermeyer turned 90 degrees south for two days until June 4th, then right for 90 degrees more and westwards until the 5th of June, when U-190 exited the region about 200 miles south of Montauk, heading towards New York City. Wintermeyer returned about three weeks later, on the 28th of June, heading east to a point about 150 miles south of Nantucket on the 30th of June. Then U-190 spent the first week of July jogging southwest and then from the 3rd due south until it exited the region heading towards Bermuda on the 6thof July. This patrol began in Lorient France on the 1st of May 1943 and lasted 111 days until the 19th of August. U-190 found no targets during this long patrol. It was discovered off Cape Hatteras on 28thMay by a USAF Liberator aircraft piloted by Lt. J. M. Vivian and damaged but survived. As Wynn (Vol. 1, p.141) says, “A marked increase in American air activity made U-boat operations extremely difficult and ship-sinkings were few.” On the way to the Americas U-190 participated in a nameless wolfpack from 5 to 10 May, again without direct result. Max Wintermeyer was born in Essen in February 1914 and survived the war, living until 1990 and age 76. Over his career he sank one ship of 7,015 tons and was decorated with the U-Boat War Badge 1939. 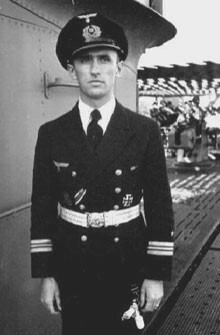 A member of the Crew of 1934 he served as 1st Watch Officer of U-105 for 150 patrol days. Then he skippered a training boat, U-62, not going on patrols. In September 1942 he commissioned and took over U-190, in which he accomplished four patrols for 350 sea days (Uboat.net). He moved ashore from U-190 in July 1944, serving in staff roles until war’s end (Busch & Röll).